I ‘got infected’ with jerk bait fishing several years ago. It is this method that let me discover pike fishing again. But what I am really fond of is trout fishing. I make baits to catch trout myself, I learn new fisheries all the time, which means learning interesting places in Poland. I use the camouflage and I creep to the fishery, all this to be smarter than the careful river fish. I follow the Catch&Release rule. Fishing means numerous things to me: this is a way to spend my free time, to relax and to be close to the nature. I am very satisfied when I release the fish I’ve just caught because I give my ‘opponent’ back to the nature. 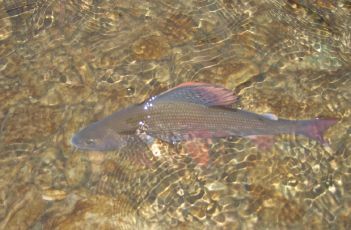 The fish gets a chance to live to its next spawning and to grow to record size. Fishing and fish are so important in my life that I studied ichthyology. Thanks to this study, I can better learn the fish behavior, their life course and their environment which results in better fishing achievements. 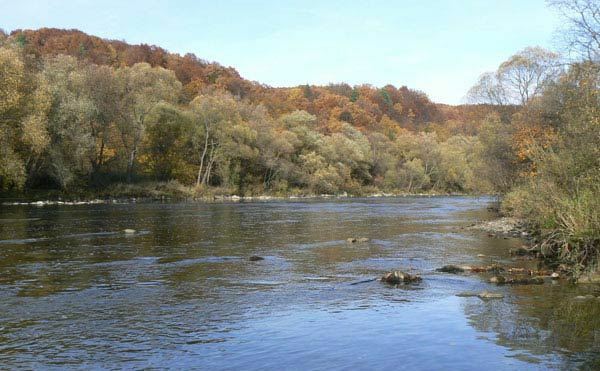 The Lupawa River is one of the most beautiful if not actually the most beautiful river of the Pomerania region. It’s very differentiated. There are deep spots with calm current intertwined with shallow, ‘mountain-like’ swift current. The bottom of the river is stony and gravelly or sandy, in parts there are rich underwater plants. Trout and grayling live over a long section of the river. It depends on the time of the year whether one should look for fish on sections with calmer and deeper or shallow swift current with well-oxygenated water. Drake flight is a big attraction of this river. If you are at the river at that time, you mustn’t miss it. The proper approach of the hosts of the fishery (including bigger fishable size requirements, lowering limits to 1 fish daily) made it possible to have good fishing scores all the season long. The river on our guide’s favorite section is not affected with melioration. Its beautiful wild character has been preserved here. The anglers may spot a lamprey looting on the bottom, a kingfisher watching its prey, or eagles circling over one’s head. This is the moment one realizes how special this place is. The Lupawa River is not a fishery for a fly anglers only. There are sections of the river accessible for the spinning anglers. 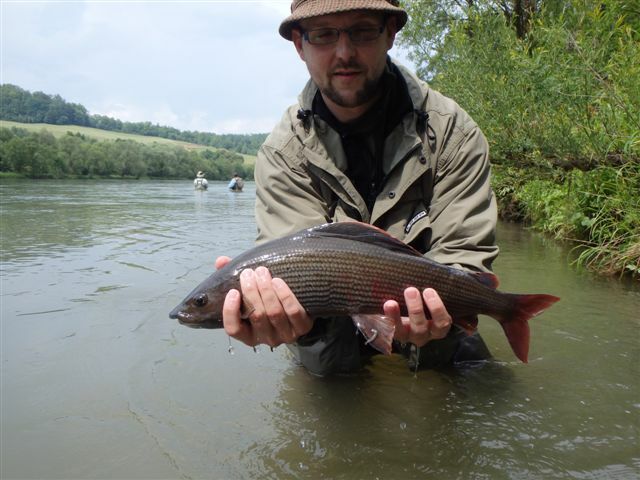 Group Trips - Łupawa river (spinning and fly-fishing section) - 2014 season - WELCOME! Dates of trips in 2014 season: 19-20.04 (2 days), 24-25.05 (2 days) + 21-22.06.2014 (2 days). 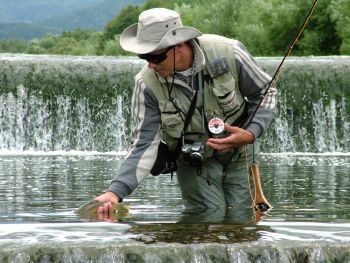 Fly fishing school included in price (instructor Łukasz Strzałkowski). If you book a month before the planned trip – 12 Euro less! Bookings: e-mail: mateusz@guidedfishing.pl or tel. +48 503 172 508. 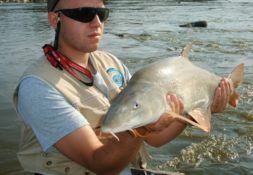 Over the two days, under the supervision of a guide, we will fish on a special section of Łupawa River. Special section is divided into two parts - fly fishing and spinning. Our guests will be able to catch both fly and spinning. 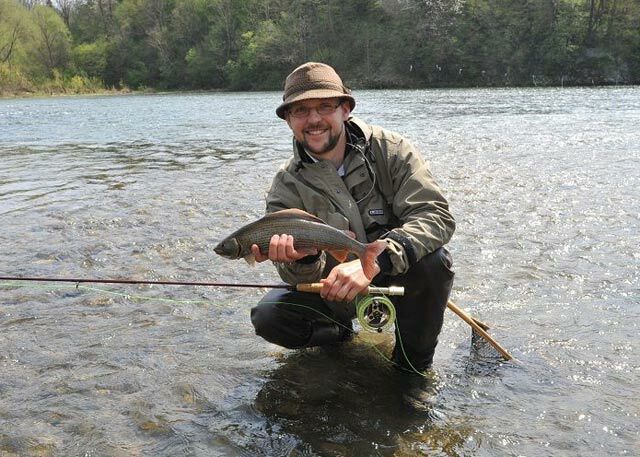 On Łupawa you can catch beautiful brown trout and grayling. Łupawa is varied enough to give everyone the opportunity to fish in various spots and various techniques. On the first day we meet up early in the morning at headquarters. Quartered in, unpack your luggage and go together to the fishery. On the second day of fishing, to the very end of the day, we are checking out the hotels and return to our homes. 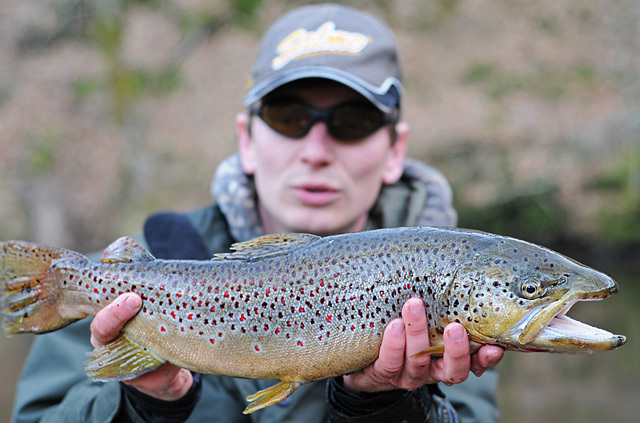 The aim of our fishing will be brown trout. 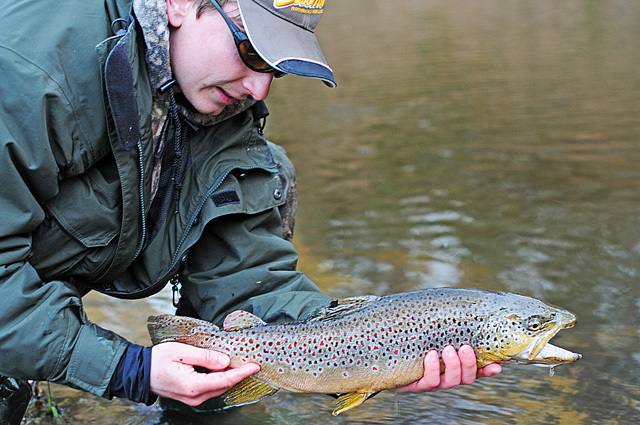 We will be fished in areas where there is a very good chance of catching big trout. 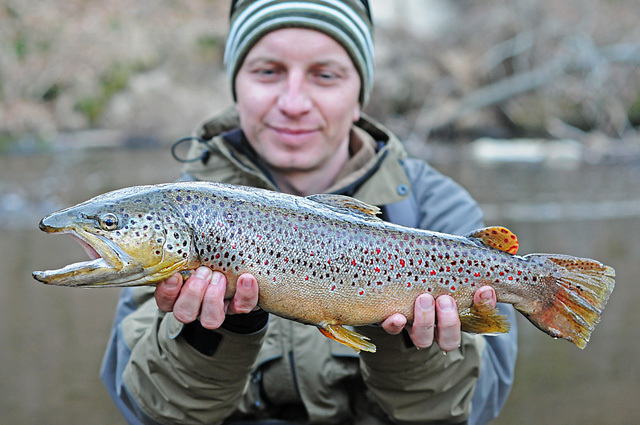 During the trip we will discuss the river spots, and we will advise you how and what to fish at these spots. NOTE! Learning of fly fishing included! We live right on the river in a house. The cottage has kitchen, bathroom, toilet and heating. On Saturday evening (after fishing) fireplace and we provide a snack. Other self-catering. You can take your lunch or shop near your accommodation. During your stay our guide will provide any advice on the proper fly fishing casts. For less experienced basic has been provided for fly fishing casts. You will see how to select a set of fly-fishing, how to assemble kit and how to tie fishing flies. Guide during the trip will be Łukasz Strzałkowski and Sebastian Kalkowski. 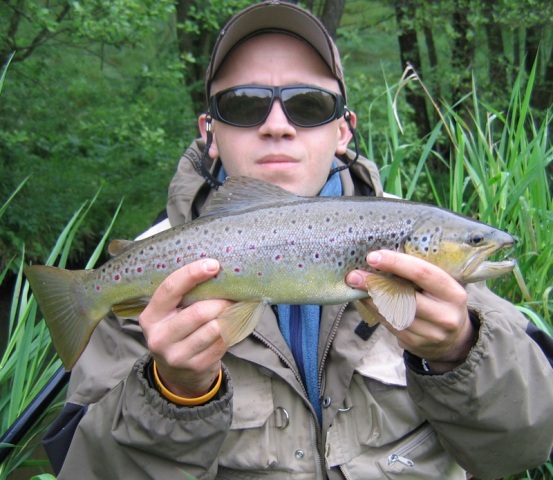 Anglers who know very well the special stage Fly - Łukasz and spinning - Sebastian. The guides at all times will provide knowledge and professional advice. Access to the accommodation on your own. We meet in the quarters. Details of the meeting after signing up on the list of anglers for the expedition, and upon payment of the advance. Food and drink for two days. 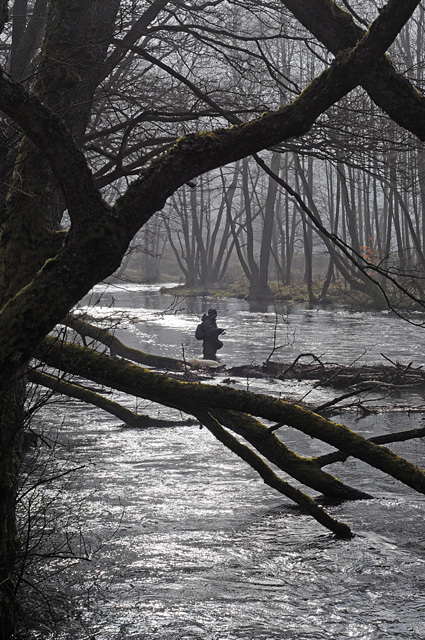 Waders are needed for deep wading. Trouts are waiting for you.